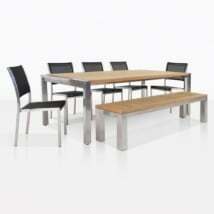 Dine in style on one of our most stunning dining sets. This 90″ Plank table and 2 benches uses only the most luxurious materials in Grade-A teak and 316 grade stainless steel. 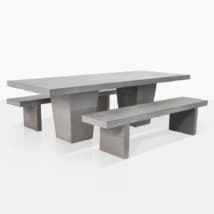 These two materials come together in a graceful harmony of modern design that will wow any guest that sees it. 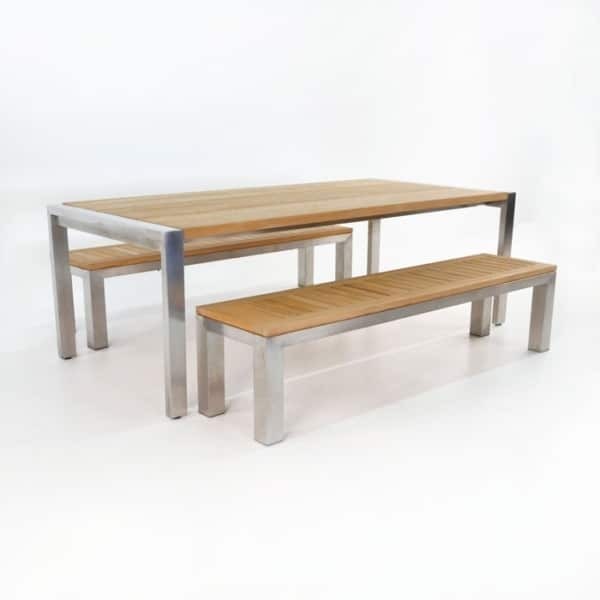 The materials used in this stainless steel dining set make it perfect for our customers that live near the ocean or have a home in areas that have harsh weather. We use only 316 marine grade stainless steel because with maintenance and care, it should not rust. 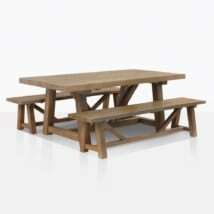 The teak we use, the Grade-A teak is the only grade that can be in harsh conditions without succumbing to the elements. The plank table features a frame made of stainless steel and a tabletop made up of teak. 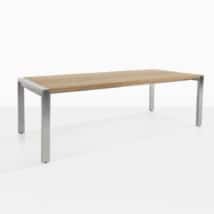 The tabletop features 3 slats of teak wood, measuring in at 13.5” wide for an exaggerated look. The total width of the table is ~41”. 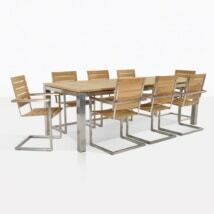 The stainless steel frame has a width of 3”, which is viewable in the product photos. 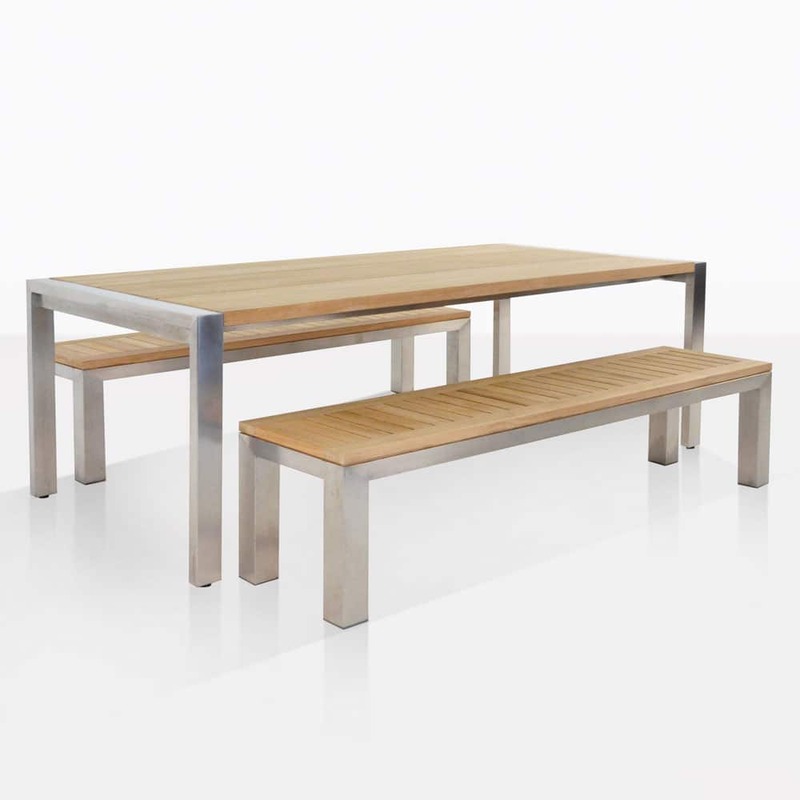 Our stainless steel and teak bench that compliments our plank table is backless and is similar in materials and construction as the table. It features a stainless steel frame and a teak plank as the tabletop. 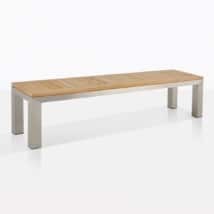 The benches come in our largest size, which measures in at 75” in length and 18” in width.